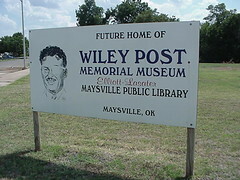 From his hometown of Maysville, Oklahoma, he explored the skies. In 1933 this self-taught scientist became the first person to fly solo around the world to prove flying safe. The pressurized flight suit he designed and developed and high altitude flights led the way for space travel as the "Father of Modern Aviation"
As a pioneer he marked the path for others to reach the moon and stars. Maysville, Ok~ Highway 19 at the corner of Williams and 6th street on the SW side of street.